Click the question to open the answer. Either re-click the question or click on another question to close the current answer. Having retired after 30 years as a police officer in London, England, my wife, Tricia and I realised our dream and moved to Corfu in 2002. At one time, this seemed an impossible dream, not only because of the magnitude of what we were planning, but the sheer logistical and legal problems involved in such a move. We have tried to approach the problems we have encountered logically and being an ex-detective, I am used to asking questions! That is precisely what we did and this guide is an attempt to put our experiences, based on the experiences of others, into writing in the hope that it may be of help to others. This guide touches upon such things as tax, banking and employment. We have no specialist knowledge in these fields. The information presented is based either upon personal experience or research. If any reader feels that there are specific inaccuracies, please contact us. We call it a guide and that is precisely what it should be taken as! Do you intend working? A single person who intends retiring and not working will have different considerations to a couple with children of school age where they both intend seeking employment. At this point in time we consider work and retirement a contradiction in terms, therefore research in this area has been minimal. Similarly, education is outside our knowledge although we understand that the education system varies considerably from that in the UK. 1a, Holland Park, London. W11 3TP. On advice, we made contact with the embassy at a very early stage. The press office were particulary helpful and sent a very thick paperback book which gave all sorts of useful and interesting information about the country. Be warned if you telephone the Greek Embassy in London. They have one of those systems which give you a 1001 options depending upon the nature of your enquiry. It may take two or three goes to hit the right department! Have a pencil ready to note down the relative (different) phone numbers. We must emphasise though, that once through to the correct department, they were very helpful, particularly when I attended the embassy to obtain an import licence for our car. Job Centres – It is our understanding that UK/EU nationals have free access to the services of the Greek employment service, the OAED (Organismos Apasholisseos-Ergatikou Dynamikou). They have a web site at www.oaed.gr. Books – Check out the local lending library. There is one book that we have heard of entitled “Living and Working In Greece”, by Peter Reynolds, ISBN: 1857036751. We can’t vouch for the content though. A Gentle Reminder! Do you recall that somewhere near the beginning of this guide I mentioned that we used a box file? Well, we have copy of an article from the Athens News ( www.athensnews.gr) entitled “Working and Living in Greece as an EU citizen”. Guess what? It is no longer available on the web! We hasten to add that this is probably because it contained information about the rules surrounding residence permits which have recently changed. Should I try to learn to speak Greek? This is difficult for us to comment upon as we have limited knowledge of the Greek language as at least one very frustrated landlord will testify! (Frustrated on account of his limited English!) However, we had four years of classes prior to our move. When asked of our ability, we always answer that we don’t think we would get lost or starve! We would suggest that Greek classes can be fun, particularly if your fellow students are interested in more than ‘holiday Greek’. That is not to decry classes specialising in teaching the casual visitor to Greece, but if you can also learn of the culture as well as the language, you will certainly find it rewarding. Be warned though. One night a week at evening classes will not get you proficient in the language! It will help though. Information on Greek language courses can be obtained from local colleges whose prospectuses are usually available from libraries. Highly recommended! The following are some sources of online information via the Internet about the Greek language. 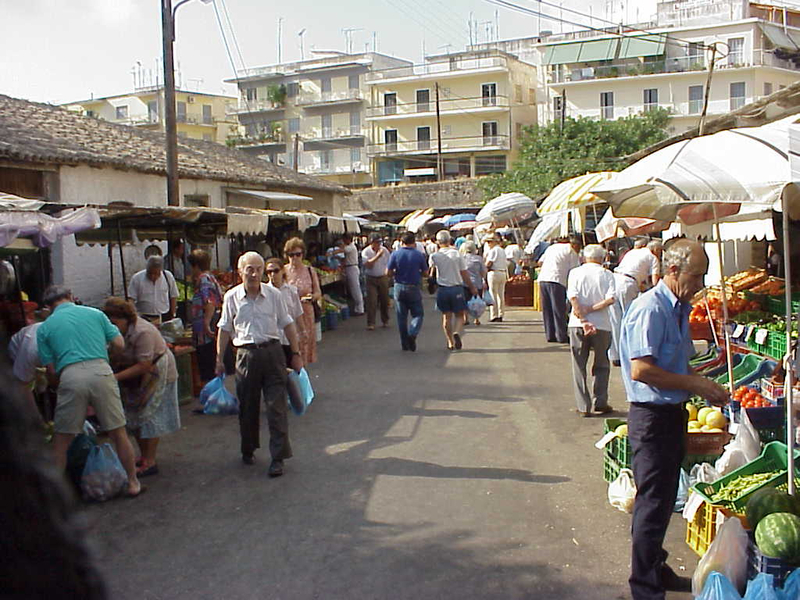 http://www.hri.org/ Hellenic Resources Network. This probably the best souce of information for information about the Greek Language on personal computers (fonts, spell-checkers etc). Should I buy or rent a property? This is a tough one. The answer will depend very much upon the individual and their circumstances. We know those who could buy property but choose to rent, those that own their own property in the UK and in Corfu and those that have sold up and now are permanently based on Corfu. Without going into specifics, we own a UK property but choose to rent in Greece although we could purchase a modest property if we wished. Our reasoning is relatively simple. 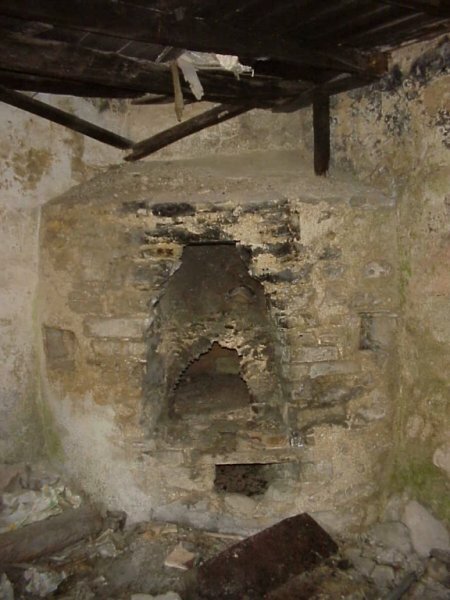 Having served 30 years as a Copper tends to make you a little cautious and that as much as we love Corfu and the people, we are reluctant to ‘burn our bridges’ at this point in time. To be honest, I have seen colleagues who have gone no further than Norfolk, who have decided after two or three years that they wanted to be back where they came from and found that they couldn’t afford to do so. 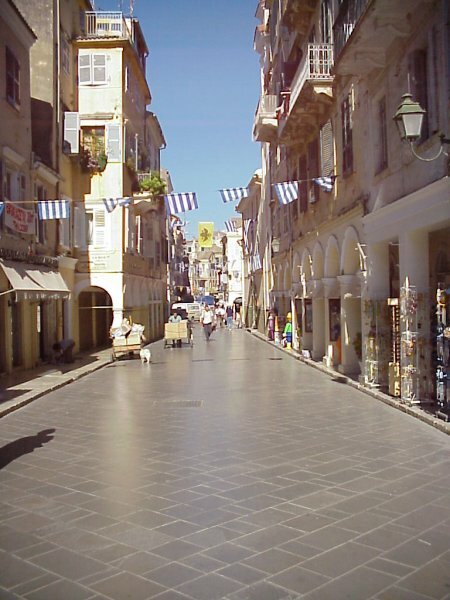 Some might look at the increasing property prices on Corfu and consider it a risk worth taking. Be warned! They are not increasing as fast as those in the UK. Property is cheap by comparison with UK prices but it can also take a long time to dispose of should the need arise. Having said all this, we are not opposed to ownership of a property in Greece, it is merely that we do not think that the circumstances are right FOR US at the moment. We have prepared a detailed ‘HOWTO’ guide to renting a property in Corfu based upon our experiences. What effects should you consider taking with you? This is not a silly question. We originally started to make plans around taking much of the contents of our UK home to Greece. Then we started to think whether our style of furniture would be appropriate for a Greek house. As we intended renting we realised that to take our furniture would restrict our choice to purely unfurnished property. Having decided what you want to take, how are you going to get it there? Essentially there are only two viable solutions. You either have your goods freighted overland by a forwarding company or you hire a vehicle sufficiently big enough, assuming that you are licenced to drive it, and transport the goods yourself. This latter solution has added problems. Apart from hire charges, insurance charges in case of breakdown, road tolls, fuel charges, and ferry charges from Italy to Corfu, there will also be some overnight stops to cater for. These may be able to be avoided if you can enlist the aid of additional drivers, but there may still be additional ferry fares. Oh yes! Did we mention that you then have to return the hire vehicle! As an aside, we found that the hirers of commercial vehicles, in general, were quite reluctant to get involved in overseas hirings. Our Solution – We decided to ship our personal effects AND our car with a forwarding company. The total cost was a little over £1,700 including limited insurance. (Total loss only). Our effects were collected from our door in the UK and delivered to our door in Corfu. On top of this we had to pay for single flights to Corfu. We had 3 items of minor, inconsequential damage and all goods were in Corfu within 5 days. At the time, we considered this the better option for us and have not changed our mind. What was the hardest part? That’s easy! Packing it all. Ask Tricia! You really need to get same same sized boxes for easy stacking. We used smaller boxes for heavy items like books – Don’t try packing a box the size of a tea chest with books and expect to lift it! It sounds obvious but our forwarding agents assured us that people do try! The final hard thing is living when all your every day items are on their way to Greece! Marks & Spencer did very well out of us for that week! Taxes, taxes and even more taxes! Consider where you are going to pay income tax – if indeed you have to! There are reciprocal arrangements between many countries, Greece and the UK being two of them. If you are not earning an income in Greece but are in receipt of money upon which income tax has been paid in the UK, we understand that you are not liable to pay Greek income tax upon it. However you will have to register for tax and you will have to satisfy the Greek tax authority that the tax has been paid in the UK. Does that make sense? I hope so. Full details for UK citizens can be obtained from the HMRC website – highly recommended. We have heard many stories about Greek bureacracy. One thing that we can tell you is that if you wish to live in Greece and enjoy such things as the luxury of a telephone, running a car legally then you are going to have to register for tax. This is not difficult. The fourth HOWTO guide gives information about registering for tax and obtaining a tax number in Corfu. It also outlines how we are trying to keep on the right side of the Greek tax authorities! To access it, hit the FAQ menu button and make your selection. Well, that’s about all on this subject. These are just our observations on the considerations that we feel to be important if one is to make the move from your home country to Corfu. Obviously, if you intend working and / or selling your UK home, you will have many more considerations. If you have any comments, please feel free to Contact us. Can you give an alternative viewpoint on moving to Corfu? Guest Contributor – Carol Stroud! We first met Carol and Pete Stroud in Kalami shortly after we had taken up residence in Corfu. 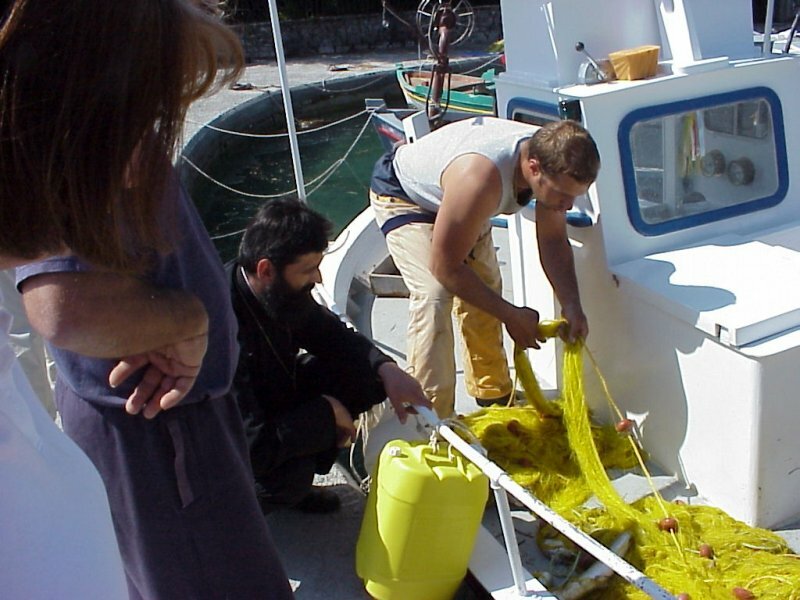 They explained that they were contemplating coming to live in Corfu in October 2002. I must admit that it was with a degree of smugness that we told them that we had done just that! Shortly after their arrival here, Carol told me that she had written up details of their preparations for moving here and had kept a journal of their overland journey from the UK to Corfu. She had had a bit of a mishap whilst trying to get it printed at a local internet cafe and so I offered to re-type it and asked if we could publish it on our website. I am glad to say that she agreed! So, for another viewpoint on taking the plunge and moving to Corfu, read on. However, the reader is reminded that prices quoted were applicable to 2002! Things will have changed! I was unsure as to whether Carol’s account should be included in the rebuild of the site. There were two things that swayed me to include it. Firstly, it is an account of making their own way overland to Corfu – Something that we have never done. Secondly, it provides an historical record of the costs involved. which those who have also made the journey overland may find interesting! The details of Carol and Pete’s overland journey from the UK to Corfu, together with costs, will be of particular interest to many. Please note that the prices and conversions were correct as at November 2002. Firstly we made our Will. I think this convinced our family that we were serious, after boring them rigid for many months. As we own our home, we decided this was our major asset, and as we had planned to rent for a year in Corfu before burning our bridges by selling up immediately, we decided to rent out our property. Agencies were contacted and, very quickly, a tenant was found. The agency takes 1% more for overseas landlords, bringing their charge to 11% of rent monies for checking out tenants, arranging contracts and paying money into our bank account. The agency registered us as overseas landlords with the Income Tax office. If this is not filled in, the agency takes 25% of your rent to hold for tax! Worth doing! They also check the property on a regular basis to ensure the correct number of people are occupying it, that they are keeping it tidy and the garden is being maintained. We were pleasantly surprised at the amount of rental we could get as this would pay our Corfu rent plus some over. We had two months to redecorate, carry out repairs and decide what to take with us, what to sell and what would have to go into storage. This was very difficult! We sold some of our things at car boots, some we advertised on shop notice boards and some went to auction and still we had loads to pack into storage. Storage is more expensive than we thought originally, averaging £25 per week plus £250 to move our things to their warehouse. Luckily for us, family came to our rescue with the offer of a dry, sound garage which we could start filling with small items. The day before we set off (which I would not recommend!) we hired a lorry and took the larger items over to be stored. This was harder work than we thought, especially as we now had to clean through, read meters and return the keys to the agency. We had decided to drive to Corfu as this would enable us to take more than allowed baggage allowance on a plane, plus we had the benefit of seeing many countries and arriving at Corfu with our own car. Originally we had decided to buy a second-hand Suzuki jeep as they are used by the Corfu car rental companies and therefore, we hoped, would be easily repairable if necessary. Unfortunately, we ran out of time, the jeeps hold their price and we would have lost money on trading in our car (a VW Polo). The only insurance we found for travelling in Europe for one year was through the AA who use AXA Insurance Company ( but who will not deal with you direct). There may be others but we did not find any. The car was serviced, taxed and MOT’d for a year also. This will cover us for the first six months after which we should register the car with the Greek authorities and have Greek plates. We will sort this out at a later date! You also legally have to buy a red road triangle, fist aid kit, GB stickers and headlight beam deflectors for driving in Europe. After informing all utilities, TV licence etc., and packing what could be squeezed into our car – car tools, basic maintenance tools, books, clothes, some Christmas decorations, a small CD player and CDs, art equipment, some bedding, mosquito nets for the beds, binoculars, cool bag, candles, towels and tea towels……..we were ready! On October 2nd we took the ferry from Harwich to the Hook of Holland which cost £108 for two adults and a small car, one way of course! This left at 10.30 am and arrived at 3.30 pm ready to get a couple of hours driving under our belts. ( We used the AA route from the internet). The first nights stop was in Brussels where, by much luck, we found a Formule 1 hotel which provided basic, clean accommodation for one price – here 31 euros for the room which sleeps 1,2 or 3 people. Excellent value! Many travellers and drivers use these, so do not leave it too late in the day or they may be full. The room had a double bed with bunk bed over, a washbasin, TV and alarm clock. There are WCs and showers on each floor that are cleaned automatically after each use. Continental breakfast is also one price – an all you can eat buffet. Belgium, Luxembourg, France, Germany. Stopped at Formule 1 in Basle – 24.50 euros! Breakfast 3.40 euros. Switzerland and the first border control where we were asked to show our passports. You pay 30 euros for a vignette sticker for the car to travel on Swiss autoroutes. This is valid from December 1st of the preceding year to January 31st of the following year. Into Italy. Be ready for very fast driving! On to Venice – poorly signposted – to discover ferry had sailed 45 minutes before! So onto Ancona (An extra 5 hours driving) to be ready for the next days ferry. Again no info about ferry times at either port after booking office closed. (May be more prepared to get ferry times before travelling but I could not find out from the website). Stayed overnight in Ancona at Hotel Rosa – 80 euro for double room – superb luxury after Fomule 1s. Booked ferry to Igoumenitsa as there were no ferries direct to Corfu that day. We left at 1.30pm to arrive at 6.30am the next day. (Cost 139 euros.) TIP: If travelling out of season, it is worth buying two deck tickets and a ticket for the car as we did. Then see the pursor after setting off. We were offered a four berth outside window cabin for less than a two berth economy cabin. The ferry was very luxurious and the cabin was excellent. The food was good value. We arrived at Igoumenitsa at 6.30am and then caught the 9.30am ferry to Corfu. This cost 33.60 euros. The journey was stressful at times. The scenery through Switzerland was particularly beautiful. In our opinion this was a worthwhile adventure. Having your own car means that you travel in comfort with as many of your possessions as you can pack in.